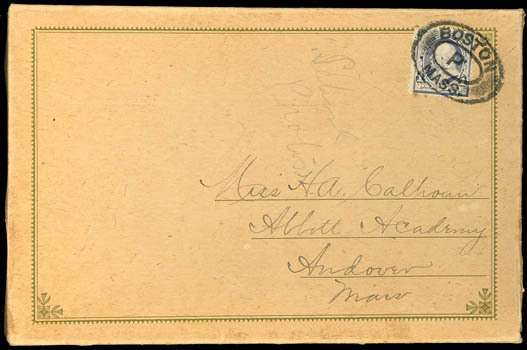 1890, 1¢ dull blue, tied by "Boston Mass., P" third-class oval postmark on intact cabinet photo box from Jas. Notman Studio, Boston to Abbott Academy, Andover Mass., light pencil "School Photos" docketing, accompanied by two cabinet photos of classmates at Abbott Academy, Very Fine. Scott No. 219 Estimate $150 - 200. 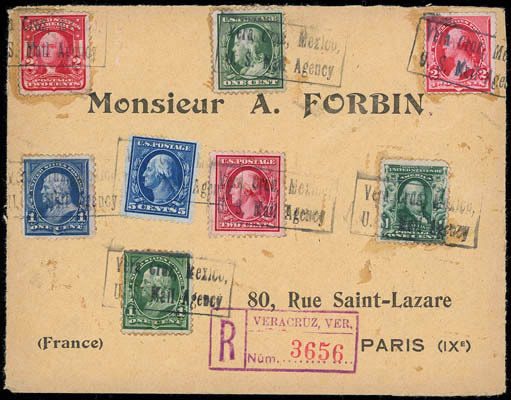 1890, 2¢ carmine, in combination with 1¢ Bureau issues (264+279), 1902-03 Definitives (300+319) and 1908-09 Washington-Franklin issues (331-332+335) on 1914 registered cover to Paris, France, all tied by "Vera Cruz, Mexico, U.S. Mail Agency" boxed handstamps, violet registry handstamp, reverse with violet "Vera Cruz, Mex., U.S.M.Ag., Registered, Aug 10, 1914" cds's; cover opened at side for display, Very Fine, an attractive and scarce usage from the U.S. Mail Agency in Vera Cruz. Scott No. 220 Estimate $200 - 300. 1890, 5¢ chocolate, tied by "U.S. 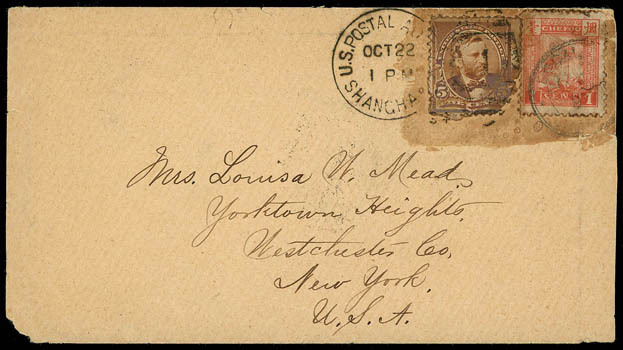 Postal Agency, Shanghai, Octr 22 '94" duplex postmark on cover to New York, in combination with China, Chefoo Local Post 1894 1c rose red (10) tied by "Chefoo Local Post, 71 Oct. 94" cds, second strike on reverse along with San Francisco transit and Shanghai Local Post cds; stamps faulty with gum staining, Fine appearance, still a very rare combination. Scott No. 223 Estimate $300 - 400.